- Includes battery, charger , allen key, and both the metal and 3D-printed pommel. A lot of the accesories from switch box, screw mount under the bunny ears, and the grip are 3D-printed. They are glued in w/ different materials and glue does not show. There is some debris and a few hints of markings (see pictures). 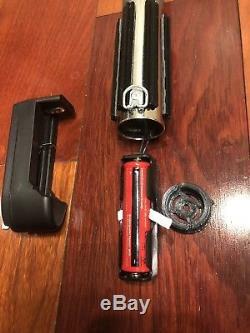 Really nice hilt, super modified from Etsy. 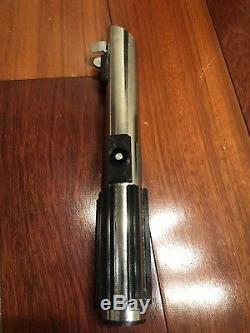 Graflex-inspired desgin for all Luke fans. 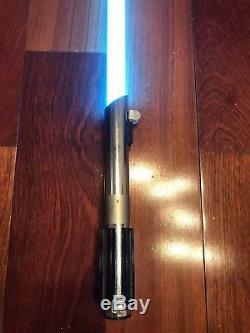 12W arctic blue LED from Saberforge (super bright) & 32in ultraedge blade from ultrasabers. Saber has a 1in inner diameter. 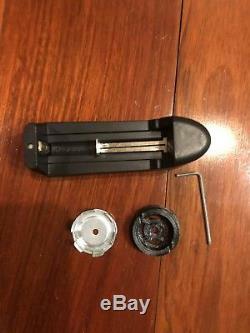 Metal body & has a D-ring attached. Battery is protected by 3D-printed surrounding and foam. Saber and blade have a few small (barely noticeable) markings from slight use. No sound, no blade plug included. If you have anymore questions or there is anything I left out, please feel free to message and contact me. The item "Ultrasabers/SaberForge style Lightsaber with 32in blade & 12W arctic blue LED" is in sale since Sunday, November 18, 2018. This item is in the category "Collectibles\Science Fiction & Horror\Star Wars\Products, Non-Film Specific\Lightsabers, Weapons". The seller is "spicycurry32" and is located in Denver, Colorado. This item can be shipped to United States, Canada, United Kingdom, Denmark, Romania, Slovakia, Bulgaria, Czech republic, Finland, Hungary, Latvia, Lithuania, Malta, Estonia, Australia, Greece, Portugal, Cyprus, Slovenia, Japan, China, Sweden, South Korea, Indonesia, Taiwan, Thailand, Belgium, France, Hong Kong, Ireland, Netherlands, Poland, Spain, Italy, Germany, Austria, Israel, Mexico, New Zealand, Philippines, Singapore, Switzerland, Norway, Saudi arabia, Ukraine, United arab emirates, Qatar, Kuwait, Bahrain, Croatia, Malaysia, Guatemala, El salvador, Honduras, Jamaica, Bahamas.